Impossible is not a word it's a self imposed prison! Hello everyone my name is Todd Hemperly. 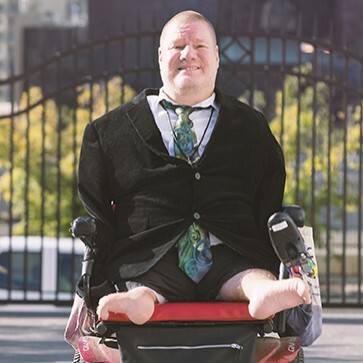 I was born without arms, deformed legs and a host of other disabilities that you cannot see. I grew up in Middletown Pennsylvania the site of the famous Three Mile Island nuclear accident of 1979. I now live in Philadelphia Pennsylvania. Life wasn�t easy growing up with so many challenges. Instead of seeing problems I saw them as obstacles to overcome. Instead of stating that everything was impossible and giving up hope, through support from my family, gifted physical therapist and most of all an iron will bestowed upon me by my heavenly father I figured out how to do everything differently. Instead of eating, typing and writing with fingers I used my toes. Instead of lifting with arms I used my neck and chin. Instead of walking I drive an electric chair with my left foot. All solutions are before me I merely have to figure them out using what I have instead of allowing my imaginations produce more problems. Instead of feeling sorry for myself I choose to be happy and delighted by the blessings that are derived by the conditions of my life. I retired from a data entry career spanning 24 years to become a motivational speaker because everywhere I look I see hopelessness and depression due the limitations people see in themselves, people�s inability to cope with their problems and the belief in people that they will never fulfill their dreams or aspirations of a better life. I exist to speak to the world about how to cope with depression. I exist to teach everyone how to live independently and overcoming obstacles to that goal. I exist to enlighten the world on how to be delighted and happy with themselves. And most of all I exist to open all eyes to the truth that everything is possible! I was born without arms and deformed legs on July 31st 1969. I went to a computer school started by University Of Pennsylvania called the Center For Information Resources where I received a certificate in customer service and data entry. They found me a job as a data entry clerk for Verizon. I retired from that position in order to inspire the world as a motivational speaker. Find out more about Todd Hemperly-Motivational Speaker at http://www.toddhemperly.com.